The European services sector strength contrasts with weak manufacturing conditions. Growth was led by Germany and Spain. Suggesting that the domestic economies aren't as burdened by the global trade war and Brexit drama. Resilient rate of growth that has lost some momentum. "March’s IHS Markit Eurozone PMI® Services Business Activity Index rose further above the 50.0 no-change mark, reaching a level of 53.3, from 52.8 in February. The latest reading was the best recorded since last November. Growth was led by Germany and Spain, where rates of growth strengthened since February. Ireland also saw a marked rise in activity, whilst solid growth was recorded in Italy. France returned to marginal contraction." Supporting the upturn in overall activity was a rise in new business volumes, which grew to the strongest degree in four months. The more positive demand environment encouraged firms to again take on additional staff at a solid rate. Germany, Ireland and Spain all recorded notable gains in employment since the previous month. Wage pressures remained a key source of rising overall operating costs during March. That said, the degree to which input prices increased was the lowest recorded by the survey in just under a year. By contrast, output charges were raised at the fastest rate since January 2018. 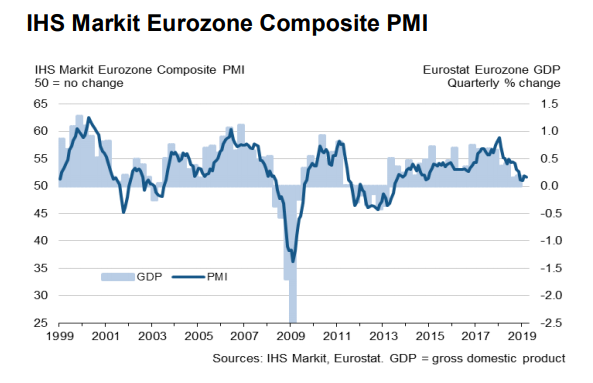 “The final eurozone PMI for March confirms the sluggish end to the first quarter, with business growth ebbing to one of the most lethargic rates seen since 2014. “Only at the turn of the year, when business was hit by headwinds such as widespread ‘yellow vest’ protests in France and an auto sector struggling with new emissions regulations, has growth been slower over the past four years. The rebound from these temporary headwinds has clearly been disappointing and is already losing momentum, led by a deepening downturn in manufacturing. The goods producing sector reports that global growth worries have intensified, meaning customers continue to pull back on spending. “The service sector has managed to sustain a relatively resilient rate of growth but has also lost momentum in recent months. This should come as no surprise as history tells us that robust service sector growth usually depends on a healthy manufacturing economy. "Germany's service sector recorded another month of robust growth in March, according to the latest PMI® survey, with the report attributing the upturn to resilient domestic demand. Amid signs of pressure on capacity, services firms upped the rate of job creation for the second month in a row." Service providers meanwhile displayed strong pricing power as they reported a survey-record rise in charges. That was despite a further moderation in cost pressures in the sector March's survey showed a slight easing of firms' confidence towards the year-ahead outlook for activity. That said, the degree of optimism was still the second-highest in the past six months and above the historical trend level. New sales and marketing initiatives, planned company expansions and the securing of new projects are all expected to support growth over the next 12 months. "The service sector had a strong finish to the opening quarter of the year, with the March final PMI data showing business activity, new orders and employment all trending upwards – the initial downtick in business activity growth shown by the 'flash' results now revised away. "The survey suggests that domestic demand is remaining resilient in the face of external headwinds, with services firms seeing the strongest increase in overall new business for six months despite a drop in new work from abroad. "A record rise in prices charged encapsulates the stillstrong demand environment facing services firms, especially given the moderation in input cost inflation to an 11-month low. "These positive developments go some way to offsetting the weakness seen in the manufacturing sector, though the latest Composite Output Index reading is still the lowest in nearly six years and points to only modest underlying economic growth." This reflected a marked fall in goods production – the steepest since July 2012. 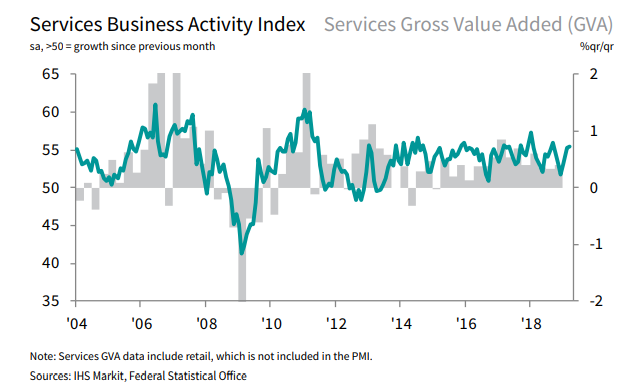 "Business activity in Italy's service sector increased at the fastest pace since September 2018 in March, with overall new order growth the fastest in six months. As a result of the rises in activity and new business, job creation among service providers picked up." On the price front, service providers reduced their output charges for the fourth consecutive month in a continued effort to stimulate sales. This was despite a further solid rise in input costs. Input cost inflation dipped slightly, but remained marked. Panellists cited greater wage bills as the principal factor behind the latest rise in cost burdens. Finally, sentiment among Italian service providers improved from February to an 11-month high in March. Panellists linked optimism to new product developments, expectations of greater sales activity and increased capacity. 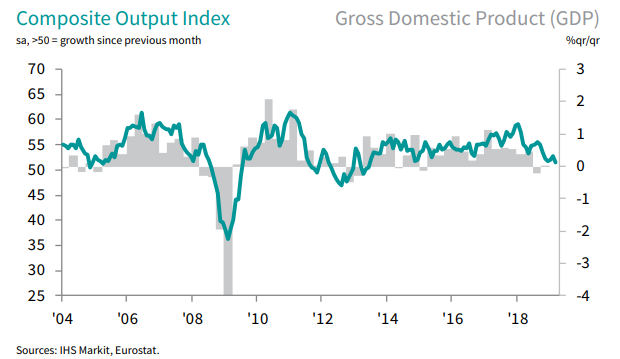 The Composite Output Index* posted at 51.5 in March, up from 49.6 in February and signalling the first increase in Italian private sector output in six months. "The latest PMI data for Italy's service sector signalled a welcome rebound in operating conditions. 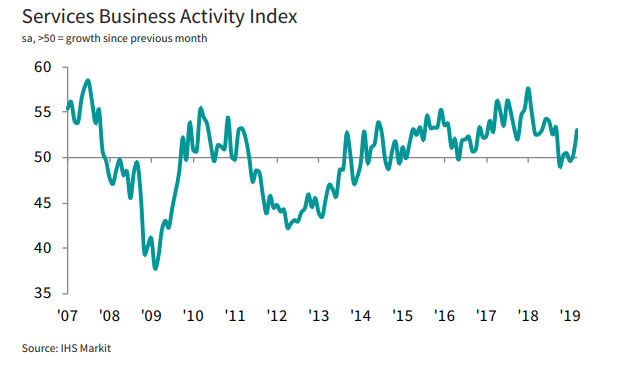 Business activity increased at the fastest pace since September 2018, whilst new orders and employment also expanded. On the price front, discounting efforts continued with the fourth consecutive decline in output charges. "Compared to their manufacturing counterparts, business activity among Italian service providers appears to be picking up steam and if continued could potentially help to lift the economy out of recession. 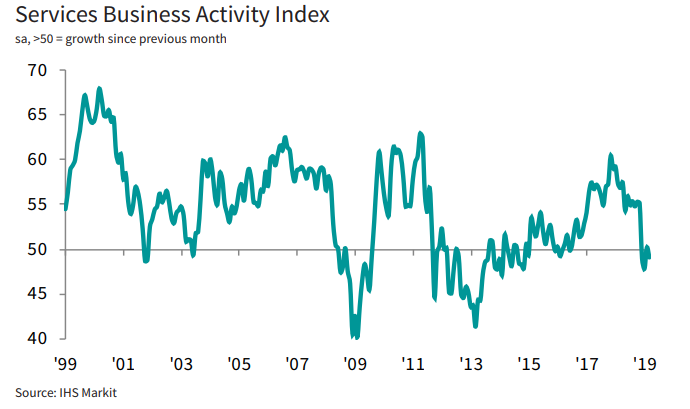 Quickest fall in outstanding business for nearly six years "
"Following a fractional recovery in February, there was a renewed decline in French service sector business activity during March. Firms reported an accelerated reduction in new orders that was partly driven by the quickest decline in export sales for three years. Consequently, backlogs were alleviated at the sharpest pace for nearly six years and the rate of job creation eased to its slowest since January 2017. Despite this, confidence towards the business outlook rose to a four-month high." A key factor behind the downturn in activity was an accelerated contraction in new business. The result represented the fourth decline in as many months, with some panellists mentioning a broad slowdown in demand. Contributing to the reduction in new work at the end of the first quarter was a further contraction in international sales. "February's recovery proved to be short-lived as French private sector firms recorded a renewed decline in output during March. Downturns in activity were registered in both the manufacturing and service sectors, as the rate of contraction in overall new business accelerated. PMI data now point to GDP growth stalling in the opening quarter of 2019. "Moreover, amid a softening in demand, there was increased pressure on profit margins during March. Despite another solid rise in overall input costs, firms could only increase average prices charged for goods and services marginally, and at a slightly slower pace than in February."